Better Know a Knick: No. 9 Roger Mason Jr. The Knicks' season begins in about a month. We couldn't possibly be more excited — finally, a Knicks team with barely an Isiah Thomas fingerprint on it! — so, until the season starts, we'll be counting down the ten most important Knicks twice a week until opening night on October 27. The best sign we can give you: Eddy Curry isn't among the eleven. 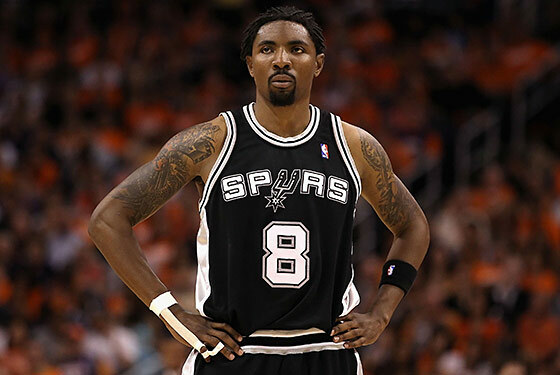 Today: shooting guard Roger Mason Jr.
Roger Mason Jr. is capable of starting for a playoff-caliber team. He did that very thing two years ago for the San Antonio Spurs, starting 71 times for a team that fell in five games to the Mavericks in the Western Conference quarterfinals. But he shouldn't start for the Knicks. His job is to be the assassin. He is the ideal hired gun. The man has certainly proven to be clutch; it's difficult to watch this compilation of last-second jumpers and not get excited. After spending several years overseas before finding a spot with San Antonio, Mason is eager to prove he still belongs in the league. Other teams are clearly skeptical; usually, shooters of his supposed quality go for a lot more than $1.4 million over one year. But Mason is a luxury item, and the Knicks haven't exactly had many of those in recent years. Ideally, he spells Kelenna Azubuike, Wilson Chandler, and even Danilo Gallinari early in games and shows up at the end to drain jumpers. If he doesn't work out, if he's still hurt, the Knicks haven't lost much. If he plays too many minutes, you'll know that something has gone wrong. But as a sit-out-and-wait-on-the-perimeter-for-someone-to-throw-you-the-ball specialist, if he's right and healthy, the Knicks have one of the best. Mason is nothing but upside. For the Knicks, that's something new and kind of special.